Pull retractable storage hooks out to lock rings and hang file away neatly; tabs push in to open rings for easy document removal. Hanging storage hooks retract when binder's in use, so papers won't catch, snag or rip and binder looks neat and professional. 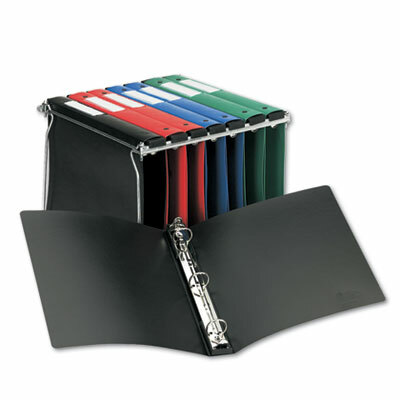 Rings lock in place so binder contents stay neat, organized and securely in place. Handy spine label lets you identify contents quickly. Pull retractable storage hooks out to lock rings and hang file away neatly; tabs push in to open rings for easy document removal. Hanging storage hooks retract when binder's in use, so papers won't catch, snag or rip and binder looks neat and professional. Gap Free™ feature prevents ring misalignment so pages turn smoothly. Rings lock in place so binder contents stay neat, organized and securely in place. Handy spine label lets you identify contents quickly. PVC-free.